Sri Lanka is famous for lush forests and iconic tea plantations, golden tropical beaches, rolling surf, roaming elephants, madcap monkeys and some of the world’s most interesting and ancient architecture. But cycling? Not so much. Or, so I thought. When a ride buddy at my cycling club (Dulwich Paragons) suggested that me and my pal Ria give Sri Lanka a whirl for a winter cycling break, I was a bit sceptical. Surely the roads would be dodgy, the climate would be too hot to go any real distance, and the country isn’t really set up to support cycling tourists? ‘Oh contraire,’ claimed my esteemed Sri Lankan advocate, who had organised countless training rides out there with a local crew, Pedal Sri Lanka. After a couple of emails back and forth with Vernon (who was to be our host for the trip), I was presented by an itinerary that promised beautifully smooth roads, 5 UNESCO World Heritage sites, two safaris, elephants, leopards, monitor lizards, water buffalo, turtles, monkeys, crocodiles, local guides and sensational local food. I was also promised that all accommodation would be sorted for us and all we needed to do was turn up with our bikes. Too good to be true, right? With pre-Christmas craziness meaning we had zero time and even less headspace to properly organise anything, it was the promise of that all-in-one package that really swung it for us, so we booked our flights to depart on Christmas Eve and toasted Vernon (in anticipation) with an Aperol Spritz (or three) before boarding. With two weeks cycling ahead of us, we had everything crossed that the itinerary was as good as it looked. 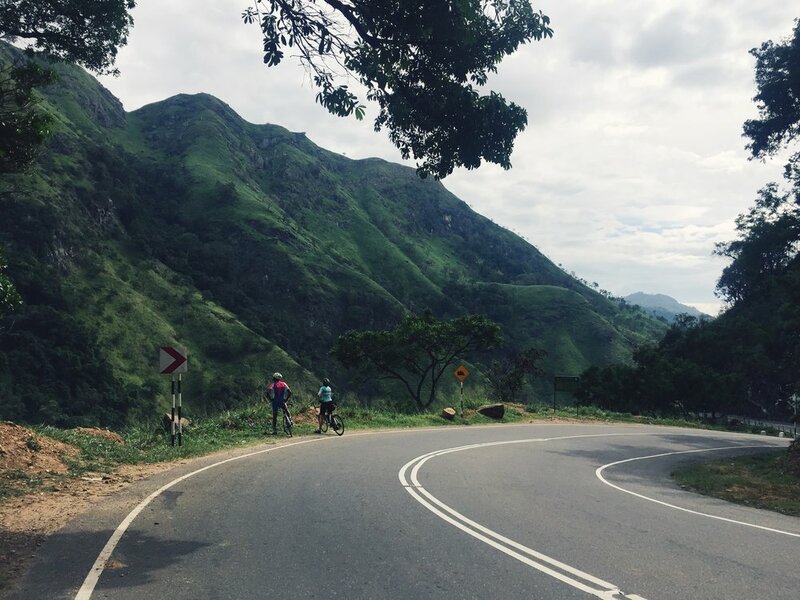 A quick update before you read on: Casquette has partnered with Pedal Sri Lanka to host a special Casquette Sri Lanka 14-day cycling tour in March. You can find out more at the end of this piece. As we step off the plane we are hit by the pleasant warmth and delicious sun – a welcome sensation for our sun-starved Blighty bodies. Laden with luggage and our bike boxes, we stagger out through customs to be greeted by the biggest grin ever and a welcoming hug from the ever-vivacious Vernon, who picks us up and ferries us over to our beach hotel in Negombo. Tick. Once there, we sup on a medicinal gin and tonic, then spend the afternoon building our bikes and swimming in the Indian ocean. So far, so blissful. The next morning, we set off on a tough, yet flat ride to brush off any cobwebs and jet lag. This takes us along Sri Lanka’s gorgeous northern beaches through rural farming communities and to the magnificent Murugan Hindu Temple. The scenery is sensational, the roads are really, really smooth, the cars are respectful and the people we pass as we ride are really smiley and friendly. Crucially, every 25 miles or so, we stop, have a drink and congregate by our support van, where our lovely driver, Priya, has picked up various local delicacies for us to refuel on, including egg rolls. These are NEXT LEVEL cycling snacks and consist of a boiled egg wrapped in curried potato, then covered in bread crumbs and fried. Like a Sri Lankan vegetarian scotch egg, this is oh, so good! The roads in Sri Lanka are in great condition, with many resurfaced recently, and they are also surprisingly quiet outside of the towns. Speed limits are generally adhered to and drivers are friendly and curious. With that many kilometres around the island, you get to enjoy a mix of scenery and climbing, with the beaches promising gloriously flat roads and glimpses of that twinkling blue Indian ocean and the tea region in the mountains matching anything you have undertaken in the Alps. My favourite climb was a cheeky seven miler up to the tea plantations, where I really had to dig deep to make it up there, disappearing into myself to find the strength to take on another switchback. I am SO pleased I did as the reward was stunning views, treacle cake and lashings of tea at the top. Ria wasn’t feeling it, so jumped in the support vehicle for a cooling drink and a banana, shouting encouragement from the van as I kept slogging. Possibly one of my favourite EVER ride days was the reward after all that climbing (a total of 40km climb in four stages), where you descend down the Ella Gap to Yala National Park, switching back and forth as you career downwards surrounded by lush vegetation and silence. With almost 80km of pure downhill, I felt spiritual as I rode and almost invincible. If I could bottle that feeling and sell it, I would be a very, very wealthy individual. Because you are touring, you never stay in one place for any longer than a few days, but all of our accommodation was great. My favourite was probably the Oak Hill Summer Breeze in Little England because of the surroundings - beautiful moutains and steamy clouds. Saying that, you can’t beat a place with a pool after a day of hot riding (which the majority of our hotels boast), or a private secluded beach and sheltered reef-protected bay, which we enjoyed at Paradise Beach Resort while cycling south to see the turtles. Holy Macaroni! Sri Lankan food is probably the best in the world, so there’s very little chance that you will come back from this trip having lost your waistline. It’s all SO good, why deny yourself?! Placed on the ancient trade routes between the east and the west, Sri Lankan food has influences from all over the old world, with these influences cleverly combined in the plates you enjoy. Our personal favourite dishes were brinjal - sweet and salty fried garlicky aubergine goodness….piled high on popadoms, my word!. Then there is wadai - a really tasty freshly cooked dhal ball…. just awesome riding food; devilled Fish - sweet and sour’s angry cousin; devilled Soya - the vegan protein alternative with just as much amazing flavour and the Roti - OMG, the roti. While out riding you get to sample local snacks of fresh baked buns, cakes and savoury food. Did I mention the roti and egg roll? And if you want vegan, vegetarian, gluten free or anything else, the guys at Pedal Sri Lanka are happy to help. You just have to ask. What I really loved was that it felt like you were getting a real slice of Sri Lankan life, rather than getting a diluted westernised version, which really does make the trip. Sri Lanka is a really friendly place and people are incredible friendly and smiley to each other and tourists. Hassling is not in their nature and they are very chilled. If someone does shout at you from their cars, it’s probably to say: ‘allez allez’ or ‘go go go’ as we cycle past. Don’t be alarmed - Sri Lankans love their cycling and it is the 3rd most popular sport in the country, so they are simply showing support. The Sri Lankan support team are brilliant and a real laugh. Vernon Fernandes is a fully qualified and very experienced national tour guide and a huge cycling enthusiast. He also loves Sri Lanka’s wildlife and history and we’re sure there is nothing he doesn’t know about Sri Lanka. Even more importantly, he loves the singer Shaggy, so if you’re lucky he’ll treat you to a rendition of one of his hits - as he did for us on New Year’s Eve. Absolute gold. Prasanna Madonza is a former winner of the Tour of Sri Lanka and twice Sri Lankan national champion. Prasanna knows every road in the country and will ride with you and look after you on the road. He’s a man of few words, but you feel really safe in his presence and will no doubt pick up some of his riding style along the trip. I now have a method of traversing downhill that is straight out of the Madonza text book. Usually when you go away on a ‘cycling holiday’, it’s all about the cycling. But what really elevates this trip is that the cycling is a means of transporting you between incredible sights and attractions. There are too many to reel off here, but some of the most memorable include Anuradhapura Sacred City. A 2,400-year old ancient city with enormous stupas, the largest ancient wonders of the world after the pyramids! Sigiriya Rock, a 1,500-year old fortress and palace, built on top of a mountain! Dambulla Golden Buddha and Cave Temple. A 2,000-year old monastery (also on top of a mountain) and a 100ft golden buddha statue. And Yala National Park - famous for it’s leopards, buffalo, crocodiles, mongoose, wild boar, bears, elephants, monitor lizards, and birdlife. The big draw here is the leopards and people are all desperate to see one. We did. Well, we saw its tail and that was incredibly exciting! When it comes to highlights, there really are too many to choose from, but seeing as you’re twisting my arm, I would have to nominate that incredible climb up to the tea plantations and that spiritual descent the day after. Saying that, Vernon’s Shaggy rendition still makes me laugh when I think about it; you can’t beat jumping in the pool after each day’s riding, and riding along the coast with golden beaches on your left for three days is pretty special. Honestly, if Carlsberg (or Casquette) did holidays, this would be one. When it comes to the negative points, there really aren’t any, although seeing the devastation that’s still around from the 2004 tsunami is pretty sobering and having to fly home at the end of the trip was killer. This Sri Lanka cycling trip was honestly so good that it has almost ruined future cycling holidays for me. The cycling was unsurpassed, the sights along the way were varied, incredible and interesting; the support crew were brilliant and the food was sublime. If you are happy to go long haul for your cycling, this has to be on your list - even if it’s just for those egg rolls. Regardless of your cycling ability and ambition, this trip is perfect for getting in some good training at the start of the season, or if you just want to get away from the grim British weather with some likeminded cycling souls. I absolutely loved it.